I really do love that word. Defined broadly as “a beginning or a start,” I am keenly aware that the awarding of Walker’s diplomas during our Commencement ceremony does not mark an end but rather a beginning to the next chapter in the lives of our alumni. For our Alumni Association, this year’s Commencement marked the tipping point during which Walker welcomed its 2,000th graduate (as well as our 2,001st, 2,002nd and so on). Like my fellow alumni, I am reminded that my Walker diploma as well as those from my undergraduate and graduate alma maters is a recognition of accomplishment, but it is also a challenge, a charge if you will, to do more — to do better. An often quoted French phrase, “noblesse oblige,” literally means “nobility obligates.” Taken in more of a figurative sense, the phrase has come to be known to mean, as President Kennedy once wrote, “to whom much is given, much is expected.” A Walker diploma is a physical reminder to all of our alumni that much sacrifice and work led to their ability to receive a world-class college-preparatory education. Our graduates go on to become doctors, entrepreneurs, attorneys, filmmakers, authors and engineers among a host of other professions. They also go on to become parents and, in the not too distant future, the first of our alumni will likely become grandparents. 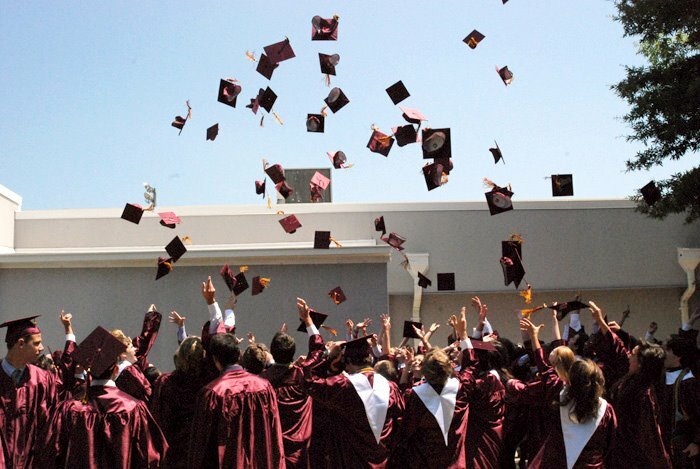 As each graduate accepts his or her diploma, crosses the stage, stops at the top of the stairs for their picture and turns their tassel, they continue our proud tradition of sending out into the world well-educated young ladies and gentlemen. From that point, they spread across the globe to campuses near and far to continue their own journeys. The Class of 2012 celebrates Commencement. Today, I did something I never thought I would do at work. I ended a nearly three-year relationship. Why talk about my personal drama on the Walker blog? You see, my practically vintage iPhone 4S took a water-logged journey earlier this morning, and we are no longer on functional terms. My phone is with me constantly. Tweeting, Facebooking, Instagramming, texting, emailing. It is always clutched firmly in my hand, sitting on the table next to me, or tucked in my pocket (not so securely, I might add). And yet here I am staring at my screen as the camera lens is clouded by water droplets, texts struggle to send, and Siri annoyingly keeps urging me to “Slide to power off.” Is the universe telling me something? One of the things that is so wonderful about Walker is the emphasis on meaningful relationships that inspire transformative learning. Social media is both a fun and powerful tool that can be used for great things, and creating meaningful relationships can certainly be one of them. However, when our alums return to campus and they reflect on their time at Walker, their memories don’t involve apps or tablets or smart phones – they involve lively class discussions, traditions like Senior Walk, and lasting friendships with both students and teachers. As educators and mentors to students who can nearly all be classified as digital natives, it is so important to practice what we preach. How can students take us seriously when we walk into classrooms and sing the praises of using social media sparingly, and then proceed to stare at our phones during any free time we might have? Is the video a little sentimental? Sure. Is it a little ironic that social media is responsible for nearly all of the 32.5 million views the video now has? Definitely. But the message is clear. Unplug from your phones. Marvel at the world around you. Take it all in. Have a real conversation – one that does not involve autocorrect. Disconnect to reconnect. This is what we tell our students, and this is what we need to practice as adults. This weekend I’m going to look up. I’m not going to scroll through Twitter (or play Candy Crush) while I drink my morning coffee. I’m not going to stop my entire family from eating Mother’s Day brunch because I need to Instagram the meal first. I’m not going to be so fixated on documenting an experience that I miss out on actually seeing, breathing, living the experience. Thanks, water-logged iPhone.